We’re a little bit late to the party but we have some great news for the PHP developers out there: PHP 7 support is now publicly available on Scalingo! 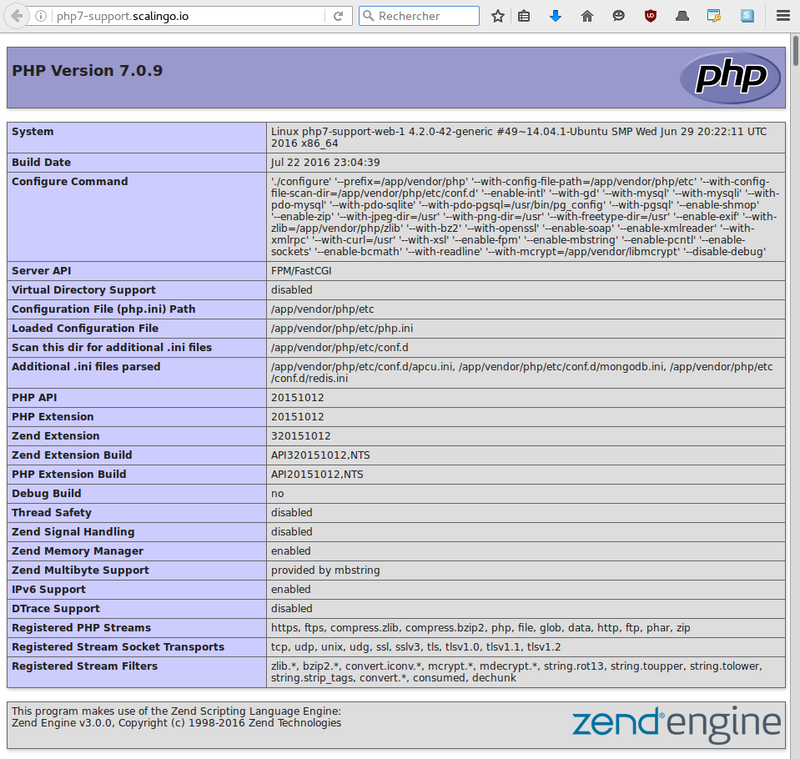 From now on, you can execute a PHP 7 application in an instant. We use our semver webservice to solve the required version. If you already have an application running, just update your existing composer.json file with a newer version. Then, git commit and git push this change. git ci -m "Test PHP 7 support"
The most awaited change in PHP 7 is the use of the new Zend Engine 3 which provide better performance. Indeed, this new version is twice as fast as the Zend Engine used in PHP 5.6. More performance improvement will be more easily achieved in the future thanks to a better code organization for a migration towards a just-in-time compiler. Do not be afraid anymore to use the assert construct when you develop a new code. The new assert has zero cost when in production. More information on thisin the documentation. PHP now provides a way to specify a type for the return value. Be aware that the behavior changes depending on the strict typing mode you use. More information on this in the documentation. Support for anonymous classes was added in PHP 7. This simple syntactic sugar add a very convenient way to create simple one-off objects. More information on this in the documentation. In older PHP versions, handling fatal error use to be nearly impossible. In production, such an error results in a blank screen for the client. In PHP 7, an exception is thrown rather than just stopping the script. Some unrecoverable errors still exist such as out of memory. To develop this feature, a newThrowable interface becomes the common ancestor for both Error and Exception. Much more new wonderful things were released in this version such as new operators, easier to use Cryptographically Secure PseudoRandom Number Generator (CSPRNG)… Read the full blog post andchangelog for a comprehensive list of novelties. igbinary: support for PHP7 is in a different project. It is not yet working. libevent: not meant to be used with PHP >= 5.4.
redis: should work but in another branch. Not yet released in master branch.